Who on earth would ever vote Labour? History has taught us, repeatedly, that voting Labour is always a form of self harm. Like shooting yourself in the foot with a 12 bore shotgun or like turkeys voting for Christmas. Every Labour government increases unemployment. Every Labour government trashes the economy. Every Labour government reduces Britain’s place in the world. Every Labour government makes British society more dysfunctional. Labour governments have been a far bigger disaster for Great Britain than World War 2 was. And any future Labour government will be exactly the same. Or, looking at Ed Miliband, even worse. That Labour will always fail badly is because they are not driven by reality, they are instead driven by a dogma called socialism. 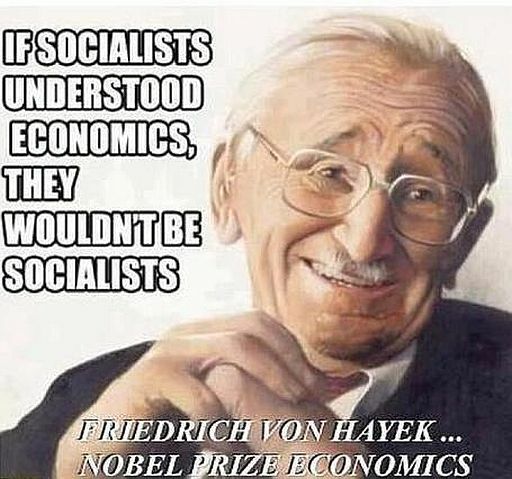 And every single time that socialism has been tried anywhere in the world it has failed. 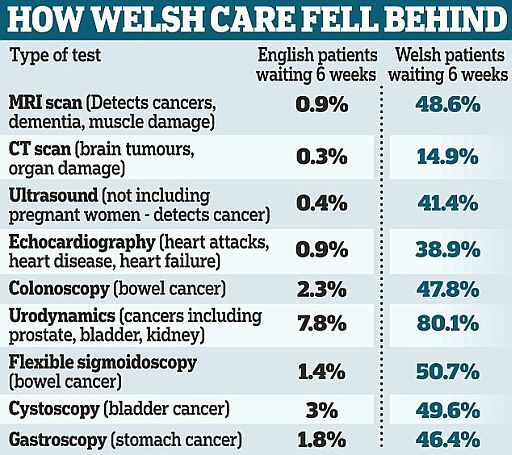 Just look at Cuba, Venezuela and what is happening to the NHS in Wales right now. I wrote an article explaining the comparison of the recent history of Cuba and Hong Kong. 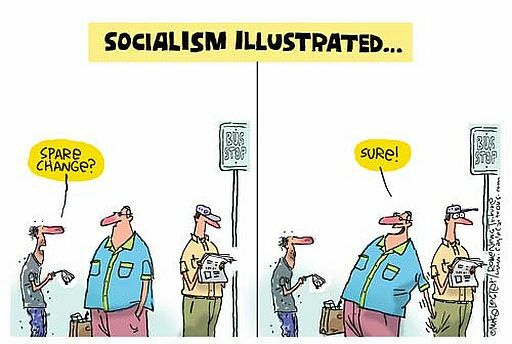 The difference is so huge and socialism causes so much harm that any implementation of it must be considered utterly immoral. Attlee 1945-51. Continued wartime austerity, when countries like Germany and France didn’t. During WW2 food was rationed from January 1940 till VJ day in August 1945. Five and a half years. Attlee rationed food from July 1945 till the Conservatives started rolling it back after their election victory in October 1951. Six and a half years. And Attlee rationing was far stricter than wartime rationing, bread was rationed for the first time and calorie intake was reduced as they mismanaged the economy. Right to the limits of starvation. Attlee nationalised about 20% of the economy, which then went into terminal decline. And in 1947 there were widespread power cuts. The USA threw money at Europe in the Marshall Plan to aid post war recovery. Germany received one and a half billion dollars (an immense amount then) and used it to rebuild their industry, from which they still benefit. UK received over twice as much and frittered it away on socialist dogma. Attlee created a massively generous welfare state where people received benefits if they didn’t feel like working and where the state thought it could spend people’s money better than they themselves could. Attlee borrowed immense amounts of money from USA and Canada, 6 billion in 1946 alone, which was wasted on fiscal incontinence and dogma and which took many decades to repay. Attlee vastly increased taxes, taking earned money out of the economy and greatly increased the number of people paying income tax with the introduction of PAYE. Gross financial mismanagement led to the huge 1947 “Sterling Crisis” which ended Great Britain as a global economic superpower. Wilson. 1964-70, 1974-76. Callaghan 1976-9. You would think it would be very difficult to screw up Britain far worse than the Attlee government had, but these two tried their best. Notably their socialist dogma of envy led them to punish people who succeed. They increased income tax to 83% for the rich, which vastly reduced the amount collected (see Laffer Curve). Not only that they added a surcharge of up to 15% for investment income, which they spitefully called “unearned income”. So the top tax rate became 98% and there was no longer any point in working hard, succeeding and building wealth. So Britain suffered very badly. As always under Labour the economy was massively mismanaged, which led to another crisis with Sterling and to the 1967 devaluation of 14.3%, which made everyone in Britain worse off. Labour tried to dictate what people were paid, the prices of goods in the shops, currency exchange rates and much more. This cause immense dissatisfaction. Just about every public service went on strike in the Winter of Discontent, dead bodies were not buried, hospitals were closed to patients, mountains of garbage piled up in the streets, 29,474,000 working days were lost directly and many more indirectly. Great Britain was trashed. Blair 1997-07. Brown 2007-10. Having supposedly learned the lesson of previous Labour disaster the new Labour government promised to follow and continue the very successful economic policies of Ken Clarke. But they couldn’t help themselves and gradually at first, but eventually at a massive rate they trashed the British economy. Their first problem was to effectively remove all control over financial markets with the creation of the supine Financial Services Authority, this obviously stored up immense disasters such as the RBS purchase of ABN AMRO, the creation of trillions of pounds of complex and ridiculous “derivatives” and the bundling of dodgy debts to securitise them on an epic scale. 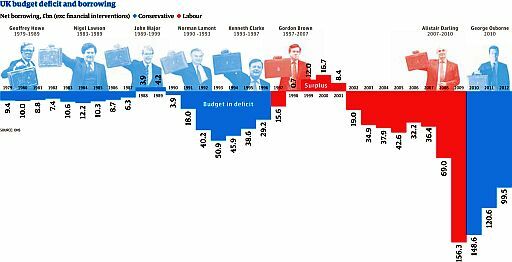 In addition Labour became increasingly fiscally incontinent, borrowing whilst the economy was booming (breaking Gordon Brown’s own Golden Rule) and spending money on an epic scale that they didn’t have and which they didn’t even have a costed budget for. Then they discovered that with the Public Finance Initiative they could borrow billions more “off balance sheet” to throw at vanity projects at immense real financial cost, to be met by future generations. The economic recession that their behaviour dropped us into was one of the worst in British history and the immense mountain of debt and structural deficit they built will take many decades to get under control. Here is a great academic paper that explains it all. Labour governments have been so utterly abysmal that it is difficult to choose which is the worst. Certainly it is utterly amazing that anyone ever votes for them again. And immoral, because voting for them harms everyone. So who votes Labour and why? Tribal people. These tend to be either unintelligent or badly educated. Sometimes both. They live in working class tribal communities and vote according to what the tribe says, not thinking for themselves. The tribal message is “us and them” class warfare. They don’t seem to have caught on to the fact that Labour is run by a rich metropolitan elite, most of whom have never had a proper job and who utterly despise the working class tribes. Young people. Our society has two institutions, the BBC and the state education system, that brainwash young people into the lie that socialism has merit. Largely because the people in these institutions have no real world experience. So the polls show that young people, due to their ignorance of reality, are predominantly Labour voters. Then as they grow older and gain experience they become wiser and more knowledgeable, they realise the error of their ways and decreasingly vote Labour. “Academics”. Some young people never leave school, they just go on to become teachers, lecturers and professors. So they never get any real world experience. So they continue to be deluded that socialism has any merit. In 2004, a poll of university academics rated Clement Attlee the 20th-century’s greatest prime minister, with an average mark of 8.34 out of 10. Winston Churchill was second, on 7.88. That is all you need to know about how deluded and plain ignorant they are. People who believe in “social justice”. These people believe Labour lies that they will, for instance, be better for child poverty. When all the historical evidence says the opposite. 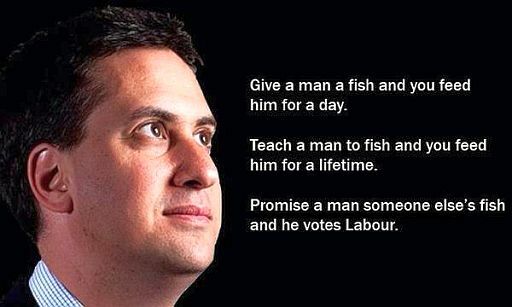 They believe that Labour will somehow be nicer and fairer. When we know that this just is not true. Labour are the nasty party. They always seek to punish successful, hard working, enterprising people. Whilst the Conservatives want to make everyone rich. Margaret Thatcher reduced the Basic Rate of Income Tax from 33 per cent to 25 per cent, and the Higher Rate from 83 per cent to 40 per cent. So people could keep the money they had earned, build wealth and create good lives for their families. George Osborne, despite Gordon Brown’s immense recession, has increased personal tax free allowances from £6,475 to £10,500, which especially benefits people climbing from the bottom of the pay ladder. Cameron’s policies have created 2 million new jobs. More than in the whole of the rest of Europe put together. The Conservatives are the party of social justice. Failures. There are two types here. Firstly middle aged people who have not succeeded as they would have wished. They blame this on the rich, who have succeeded and so seek to punish them. They never take responsibility for themselves and so don’t blame their own laziness, stupidity or incompetence. These people really are utterly immoral. Then there are old people who look back on their lives of under-performing and who blame it on those who have outperformed them. Once again bitter, nasty and utterly stupid. Envious people. An emotion that occurs when a person lacks another’s superior quality, achievement, or possession and either desires it or wishes that the other lacked it. These people are nasty, bitter, twisted and deeply unhappy. They think that the state should punish people who are more successful than them. Unfortunately socialism fosters and breeds this evil emotion, so there is a lot of it about in Great Britain. Strangely if someone is paid hundreds of thousands of pounds a week for kicking a football it is OK, yet earning hundreds of thousands of pounds a year creating wealth for society is seen as evil. This envy is a cancer deeply embedded in British society by decades of socialism and you can hear it used in every speech made by a Labour politician. They really are the nasty party. Carpetbaggers. People who become very rich or richer from espousing the evils of socialism. 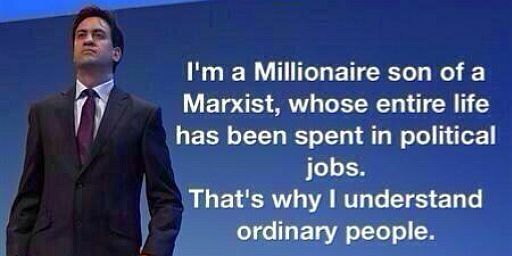 Ed Miliband is a millionaire and lives in a £3 million house. Michael Meacher has a property portfolio of ten homes. Margaret Hodge with £18 million of Stemcor is the richest woman in Parliament. Shaun Woodward sold Sarsden House, his Oxfordshire pile, in 2006 for £24 million. Tony Blair is worth £70 million. Gordon Brown earned £1.37 million last year. Tony Benn left £5 million when he died, carefully engineered to minimise estate duty. Geoffrey Robinson MP is worth £10m. And so on. Good on them, building wealth is an excellent endeavor. However the stink of their hypocrisy is unbelievable. As you can see, voting Labour is something to be ashamed of. It makes nearly everyone in our society far worse off in every way. It is also self harm just as surely as slitting you wrists with a razor is. Given that many disabled people have committed suicide because of Tory attacks on disabled people and the benefits and allowances they claim your comments are crass and offensive. Obviously you are an IDS fanatic with zero concern about the most vulnerable in society. Labour were not much better when it came to disabled people. There is no way you can prove causation. So, basically, you are lying. I’m a failure, both educationally, and financially. I started off with 10 O levels and CSEs, but I left school just before my A levels, because I could not concentrate, due to OCD. I don’t know why I developed OCD, maybe because a neighbour sexually abused me when I was 5? Don’t know, but – I don’t blame the rich. I worked at various jobs, never out of work, until I had my first child at 34. I had been married for 12 years and my husband had his own busines, we owned our own home, savings, pension etc etc. I suffered from severe postnatal depression, I was hospitalised for 10 months, ECT, a cocktail of drugs, nothing seemed to help. My husband thought I would never get well, he divorced me and took custody of our son. I lost my husband, my home, my job and, for a long time, my child. All our money was spent on the divorce, my ex hiring a nanny etc- I did not blame the rich. After maintenance payments were deducted, I received a small settlement, which I used as a deposit on a one bed back to back. It took me ages to get a job because of my mental health. I eventually got a job as a civil servant at my local court centre, and a few years later met my second husband. The first year of marriage was good, two wages coming in and someone to help with the renovation of the house. Then my husband became violent, this culminated in him attacking me with an axe. He went to prison leaving me with £15,000 of debt. I became very depressed, anxious and suffered from panic attacks and agoraphobia. I had to sell the house and could not work, I did not go further than my garden for 10 years – I did not blame the rich. I will be 60 next year and I am just starting to be able to go out, if I am accompanied. Unfortunately I now have arthritis in my spine, hip and knees and chronic digestive problems – I do not blame the rich. I survive on sickness benefit and 2 small ill health pensions, whilst still paying off my debts. If it was not for social security, and the NHS, I would be dead. I have done nothing wrong, things have just happened which were out of my control. Labour gave us social security and the NHS. I am so thankful for that. The financial crisis, and bad behaviour of banks, and other financial institutions, caused the 2008 crash, which is why, along with tax evasion and avoidance, we are in dire straits now. For that I DO blame some of the rich. Not everyone is at the bottom because they are thick or lazy, or did not try. Some people are there due to LIFE. Mine is one story amongst millions of others, people who are not bitter, envious, lazy, nasty, stupid, incompetent, or whatever other derogatory words you used, but people who are ill, abused, “life damaged”, unlucky etc Most of all they are people who need help, some will get going again, some will not, but they could all do without your ill-informed name calling! Black Wednesday, Black Monday, interest rates in double digits, etc. etc. – can’t say I remember periods of Tory stability either. Of course this, like many of the Labour examples, contain what economists refer to as externalities. Your article is so one sided it almost appears “tribal” – your description for that is apt I think. You’re wrong on Attlee. Reading a book at the minute which is an objective account of the first year of the postwar govt. It states that the UK alongside many other governments were working together to sold the shortages of staples such as rice and wheat. The UK had control over part of Germany’s supply (with the US) and India’s. Yet again blaming Labour for what was/is a ‘global’ crash, Tory deregulation of Banking was key in this situation, devised to make a small minority very rich just the same as the rest of their right wing dogma, privatisation that cost the user more and reduces quality so long as still deliver profits. 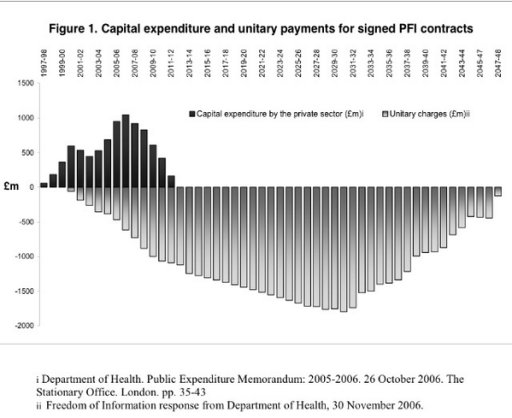 Look at Thames Water, large profits to share holders, but it’s in debt and when capital projects are required the Tax payer still under-rights them, look at Welsh water for the way it can be done, the same story is reflected across all the former private sector, poor service, so long as they can convert this rich seem it into profit for their cronies, Post Office given away for less than the value of a couple of it propeties, the NBC property laddering by the Tories, Since the recession the richest are now twice as rich! Profits is now disproportionate to earnings, I would rather support a party for the well being of the masses and not use the nation to make the few even more wealthy. Yes Labour make mistakes, Tories don’t make mistakes, its all calculated in their grand plan to bring back Victorian times. Son of a landed gentry who probably shoots grouse on his inherited estate. Nearly all millionaires are self made. Successful people. Your bitter envy is quite nasty. I am disabled and I am pretty sure it was LABOUR that created ESA and PIP, the Coalition just continued it. I do have my own beefs about how the Disabled are treated and it doesn’t really matter who is in power, all Disabled will be labelled as Scroungers, but that has nothing to do with the Government that is to do with how the Media Portray us, the one scrounger is on the front page, the 3 million who really need the help are not even in the paper. However, I would rather have a government that doesn’t spend what it doesn’t have and doesn’t treat me like a child by telling me how i should live my life, raise my children and all the other Silly nanny state ideas Labour come up with and if the government can create a society were we spend less than taxation brings in, then and only then can we afford to change things. I would start with Education. Sure the bitterness is in the writter of this article. The intention certainly is to separate “us” from “them”. The things the author wants to attack seem to be the things he beholds dearly. Bless him , all rage filled and impotent. Ooh Bruce’s bitterness and rage comes across mightily in his blog and his comments. His zero sympathy for truly ill and mentally ill and struggling working people just puts a full stop to any sense he spouts in his blogs. Sorry Brucey must try harder!